I'm trying to lock the Fn keys for my wireless keyboard without success. I have read quite a bit on this topic and non of the proposed solution are working for me. This a big deal for me so I would apreatiate if you could help me out. Have you performed Windows update on your PC? Is it for a desktop computer or notebook pc? Thx for taking an interest and trying to help resolve the issue. The bios utility image that was attached is not the correct bios windows. Turn on the computer, and then immediately press the Esc key repeatedly until the Startup Menu opens. 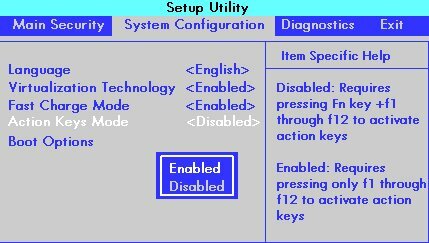 Press F10 to open the BIOS Setup Utility. It is the only BIOS i utility I can access. Pressing the ESC key on bootup has no effect. It looks like you were interacting with @Echo_Lake, but he is out for the day & I'll be glad to help you out. I have sent you a private message, to contact HP Phone support depending on the product that cannot be shared in a public post. Ok, I made an account to help resolve an issue I'm facing on the company forum. HP representative responded a number of times, without success, which is fine, since not all problems can be resolved quickly (or ever). Now you are redirecting me to submit a case and call HP representative, when it's obvious information regarding the issue is clear for anyone who is willing to assist right here along with the history of attempted solutions? Since this is not the only forum I have come accros during my years of surfing the net, ratio of posts/likes/solutions have not given me much hope for solving the issue, and I would have accepted that there is no known soultion much better then the "go ask someone in my company the same question" much better. fyi, I will not be creating any case via support, if anyone should come up with a solution and share on the forums, I would be greatfull, since i might be beneficial for someone in the future.